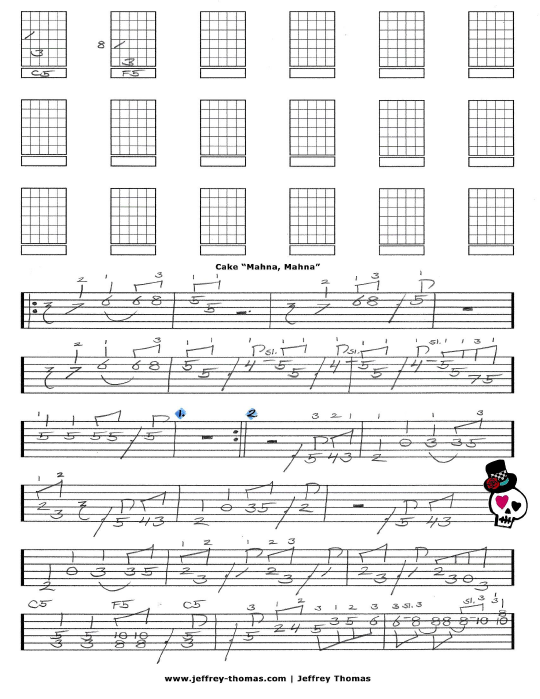 Cake Manah, Manah Free Guitar Tab by Jeffrey Thomas. I have had many guitar students request this fun little tune! This song became know internationally from it’s use on The Muppets. Cake’s version features the guitar and horns and is not very difficult to learn. Want the full guitar tab for free? Send in your email address using the form provided. Looking for online guitar lessons? Fill out the Schedule A Free Lesson form to set up your free Skype guitar lesson today. “Manah, Manah” originally appeared in a Italian film titled, Sweden: Heaven and Hell. Find more free online guitar tabs on my blog, video and tab pages.